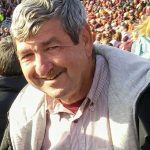 William Edward White, age 72, passed away at his childhood home on January 25, 2019, after a hard battle with lung cancer. Edward was a proud Virginia Tech Hokie graduate. He played drums for the Highty-Tighties. Edward spent his working years in the hotel and restaurant management business. In retirement, he enjoyed boating, playing tennis, watching VT and Redskins football. He served as President of the Yorktown Ruritan Club and President of the Providence United Methodist Church Men’s Club. He joins his wife Beth White in heaven. He is survived by his sister Martha Ramer, daughters Jennifer Siess and Shannon White, and four grandchildren. A celebration of Edward’s life will be held at Providence United Methodist Church in Grafton, VA. The service will be held from 11am to 12pm, on Saturday, February 2, 2019. a lunch will follow. Feel free to wear maroon and/or orange to celebrate Edward’s dedication to Virginia Tech.